Captain Heinrich Paasch was the first to recognize the complexity and variety in marine vocabulary and technical terminology and the inherent need for a cohesive classification of nautical terms. Equipped with over thirty-five years of seafaring experience, including as a sailor, captain, and as a Surveyor to Lloyd's Register, Paasch sets out, chapter by chapter, an exhaustive explanation of all the principal parts of a ship's structure and equipment. He describes the main types of steam and sailing vessels; wooden and iron hulls; propulsion machinery; anchors and related equipment; masts and spars; standing and running rigging, as well as sails, tackle, blocks and ropes. He concludes with knots, bends, hitches, and splices and finally provides a listing of standard measurements. Paasch's stated intention to describe a ship literally "From Keel to Truck" has been widely applauded as has his inclusion of the equivalent terms in French and German alongside the English. Each section is accompanied by dozens of high-quality line engravings to accompany the text and illustrate the terminology and concept described. 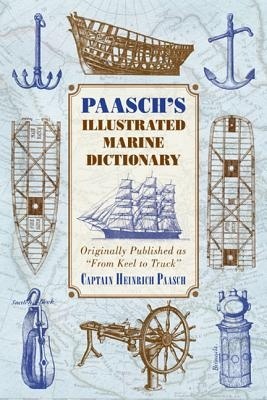 First published in, and an invaluable resource ever since, Captain Paasch's dictionary is both a full encyclopedia and an unequaled introduction for anyone interested in steam and sailing ships, life aboard a ship, engineering, or simply understanding the language. Captain Heinrich Paasch first went to sea at the age of ten in. After doing service in the German and Danish Navies and in the German, Dutch, and American Merchant Navies, he got his own command of a Russian ship at the age of. From he settled in Antwerp practicing as a ship surveyor to Lloyd's register, eventually investing a significant sum in printing 5,000 copies of this book which first appeared in as From Keel to Truck. "Click here to buy" to receive the discount price.